1765 March 20 – Michael Gawen to David Gawin 400 acres, Wits: David Bowles, John Thompson, John Gowin. in Henrico Co, Va. pg 915. 1767 David Gowing a List of Tithables Taken by Hamon Critz, Gent, for the Year 1767. Pittsylvania Co, Va 1767 – David Gowing Tax Record, 1767, , Pittsylvania, Virginia, USA. 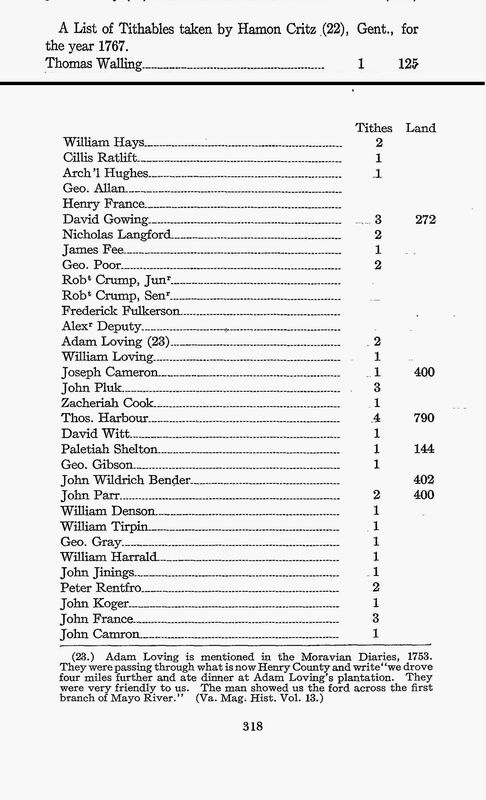 First List of Tithables of Pittsylvania County, Virginia Tax Records, Year 1767, p. 318. 3 Tithes, Land 272 . Pittsylvania Co, Va.
1770 Oct 25 – David Going and Eliz his wife of Henrico Co and Edward Barnett of Henrico, 100 acres. Henrico Co, Va pg. 260.
p. 48 Memorandum That on the 30th Day of December 1771 Peaceable & Quiet Possession and Seizen of the within Granted Land and premises was made and done and Delivered by the within named David Going unto the within named George Deatherage according to form and Estate of the within written Deed (signed) David Going . In Presence of us John Deatherage, Thos Rogers, David Mosley. Pittsylvania Co, Va. 1771 Dec 30 –DB3, p. 46 – Extracted from – Pittslyvania County, Virginia Deed Books 1, 2 and 3 – Abstracted and Compiled by Lucille C. Payne and Neil G. Payne. Pittsylvania Co, Va.
1773 May 26 – DB 3, p. 245 – LANKFORD from GOING – Deed, 26 May 1773. David GOING and Martha his wife of County of Pittsylvania in Colony of Virginia of one part and Henry LANKFORD of County and Colony aforesaid of other part……..Sum of £10 Current money of said Collony …….Land on west Side Russells Creek…..near said Creek on hill Side….in old line…..27 acres. Wit: James LYON, Robert X (the mark of) HINTON, Obediah X (his mark) HUTSON; Rec: 27 May 1773 David GOING L.S; Extracted from – Pittslyvania County, Virginia Deed Books 1, 2 and 3 – Abstracted and Compiled by Lucille C. Payne and Neil G. Payne; Pittsylvania Co, Va. It appears that by 1772, David Going has moved one county over from Hanover Co, Va, to Louisa Co, Va.
David Going was taxable in his own household in Fredericksville Parish in 1772. David Going was a taxable in the household of Pouncy Bunch in 1774. Louisa Co, Va. In 1775 David Going was recorded in the household of his brother, Moses Going, according to “Louisa County, Virginia Tithables” in 1775. In 1778 David Going was recorded in the household of Joseph Bunch. It appears that David Going Sr, then moved from Louisa Co, Va. back across Hanover Co, and one county south to Henrico Co, Va. The David Going Sr living in Henrico Co, Va’s date of birth is likely between 1721-1736 based on tithe records, and when his son, David Going Jr, became old enough to be placed on tithes. 1780 Oct 4 – On October 4, 1780, in Hali­fax County, “Shadrack Going,” “David Going” and Peter Wil­son witnessed the will of Stephen Wilson. The will was proved June 20, 1782 “by two witnesses [unnamed].” Shadrach Going appeared in the 1782 tax list of Halifax County with 12 in his family. “Shadrack Going,” with 10 members in his household, appeared in the 1785 census of Halifax County, along with John Going, four members and David Going, four members, assumed to be his sons. David Going was married to Clawey [Chloe] Webb in Henrico County. Date of the marriage bond was July 17, 1789, and the bondsman was his cousin, “John Geoine” who testified that Clawey Webb was over age 21. His cousin, Anne Going was a witness. (Note: It looks like David Going b. 1719-24 appears for the last time here in Henrico Co, Va under his “exempt” status). David Going Jr 1 tithe, 1 horse (Note: David Going’s son, David Going b. abt 1780 now shows up on tithe records as “David Going Jr”). David Gowing Senr 1 horse (exempt) (Note: David Going now “Sr” as his son is now “Jr” – it appears David Going Senr just turned 51, as he is now claiming “exempt” status). Nephew of this David Going is David Smith Going, son of Shadrach Going and regarded as a Melungeon, was born in Hanover County, Virginia November 21, 1757, according to his Revolutionary War pension application abstracted in “Tennessee Heroes of the Revolution” by Zella Armstrong. Shadrach Going was born about 1725 of parents unknown, probably in Hanover County. The county was formed in 1720 from New Kent County, the residence of Mihil Gowen when he died. Shadrach Going was married about 1748, wife unknown, probably in Hanover County. It is believed that he was married three times. Shadrack Going continued to live in Hanover County in November 1757 and in 1760 when sons David Smith Going and Laban Going were born. By 1765, he had removed to Halifax County, Virginia. Halifax County was formed in 1752 from Antrim Parish of Lunenburg County.